Below is a list of all parishes, mass times and their locations for the Diocese of Menevia. The list includes Mass Times for both Sundays & Holy Days of Obligations. Use the map below to locate your nearest parish or alternatively use the search facility. Parish Groups: Flower Team, Ladies Group, Lectio Divina, Legion of Mary, Music and Liturgy, Prayer Group, Parish Social and Fundraising Group, Pure in Heart. 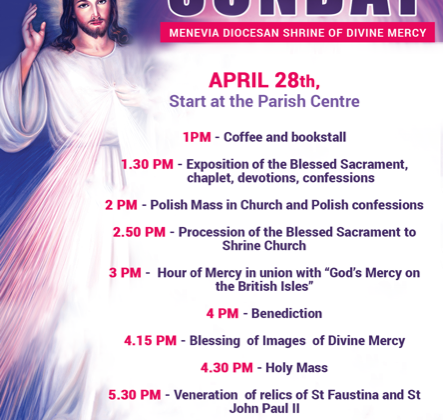 Exposition of the Blessed Sacrament – Half an hour before weekday Mass, and after Saturday morning Mass. Parish Groups: Hospitality, SVP, Guild of St Stephen, Shrine Support, CAFOD. Parish Groups: SVP, CWL, Extraordinary Ministers of Holy Communion, Catechists, Youth Group, Children’s Liturgy Group. Once the Church of the Welsh Martyrs, Penparcau, Aberystwyth SY23 1RX is open, all Masses will be held there, weekend and weekday, including Baptisms, Weddings, Funerals, Evening Prayer, etc. Sat First Mass of Sun 6.00 pm. Parish Groups: SVP, RCIA, DHS Associates, Flower Group, , Social Committee, Welsh Group, Prayer Group, Third Order of Carmel, Ascent. Sacrament of Reconciliation Sun before Mass and on request. Parish Groups: Parish Advisory Council, Extraordinary Ministers of Holy Communion, Ladies League. Adoration of Blessed Sacrament Thur 6.00 pm – 7.00 pm, First Fridays 9.00 am – 10.00 am Faith Discussion Wed 6.30pm. Sacrament of Reconciliation Sat 9.00 – 9.20 am or on request. Adoration of the Blessed Sacrament Wednesday 10.35 to 11am. Sacrament of Reconciliation Sat 10.30 – 10.45 am, 5.30 – 5.45 pm. Sun Mass 10.45 am and 6.30 pm. Sat First Mass of Sun 5.00 pm. Parish Groups: Guild of St Stephen, St Therese’s Credit Union, RCIA, Secular Franciscan Order, Senior Citizens, Housebound and Handicapped, Lectio Divina Group. Parish Groups: Lectio Divina, Catechist Group, Prayer Group, Retired and Senior Citizens, Faith Sharing Group, Advisory Group, Legion of Mary. Sat 1st Mass of Sun 6.30 pm. Wkdays Masses Mon., Tues., Wed., Fri., 9.30 am, Thurs., 7pm, Sat 10.00 am (with Exposition of the Blessed Sacrament from 10.30am). Vespers, with Exposition and Benediction: First Sunday of each month 5pm. Check Weekly Newsletter. Sacrament of Reconciliation Sat 10.30 am – 11.00 am, 6.00 pm – 6.15 pm, and on request. Parish Groups: SVP, Prayer Group, Guild of St Stephen, Children’s Liturgy, Flower arrangers and Cleaning Teams, SPUC, APF, Traidcraft, AoS, Wednesday Club, Parish Finance Committee, Parish Ladies Guild, Lectio Divina, Discover Your Faith, Wednesday Coffee Morning, Friday Film Club, Mumbles Churches Together. Clergy: Rev. Clement Oloruntoba O.P., M.A. Clergy: Canon Michael Flook, V.F. Cathedral open between 8.30 and 4pm Monday to Friday.